If you've been following my blog for the past year, then you know I am crazy about CLICK Protein Powder! Yes, it's true. I love it. I really didn't think that this was a product that could be improved -- and I was so wrong. 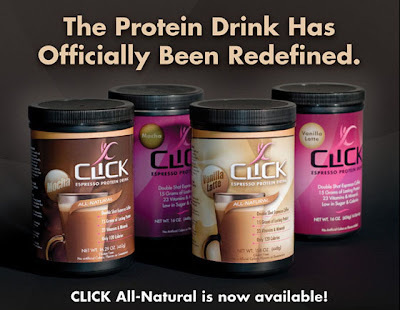 The fine folks at Click have improved the formula -- and made an All-Natural version of the Mocha and Vanilla powders! From the website: CLICK is a rich, delicious powdered beverage. Each 12 ounce serving contains a double shot of gourmet espresso coffee, 15 grams of lasting protein and 23 essential vitamins and minerals - now that CLICKs! As someone who has renewed her efforts to eat healthier and lose weight, I appreciate CLICK Protein Powder even more than before. Drinking CLICK gets me moving in the morning -- it energizes me. The wonderful people at DRINK CLICK! have generously offered one of readers the chance to try the new CLICK-n-go Pack! This pack contains 4 to-go packs of All Natural Drink Click Protein powder (2 Vanilla / 2 Mocha), a tumbler with wire whip, and a nylon DRINK CLICK tote! How cool is that? If you'd like to win a Drink Click! CLICK-n-go Pack, just follow the directions below. Visit Make Click, then come back here and tell me which hot or cold recipe you'd like to try. 1. Make a purchase from Drink Click! and tell us what you bought! 2. LIKE Drink Click! on Facebook! 9. Post the link to this contest on your blog, Facebook, or MySpace page(s) and link back here! 10. Enter another contest on our blog and then come back and tell me which one. BONUS ENTRIES!!! -- Want *6* bonus entries? This contest will be open from Wednesday, June 15th until Thursday, June 30th. Winner will be announced on Friday, July 1st. The Drink Click! Prize will be sent directly to the winner by Drink Click. 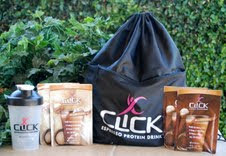 DISCLOSURE: I received 4 complimentary samples of Click Protein Powder for the purpose of review. I was under no obligation to review this item. I received no monetary compensation. The opinions expressed are based on my own use and experience with the item. Tawnda M LIKE Drink Click! on Facebook! Tawnda M LIKE Once upon a Review on Facebook! I'd love to try the CLICKatini recipe. i like the Pumpkin Mocha Spice recipe! YUM, I'd make a CLIK Banana Nut! The Iced Click Choco Cafe sounds great! I'd like to try the recipe for iced drink: Cinnamon Bliss Click. I subscribe to the Click newsletter. I'd like to try the Candy Cane Click recipe.